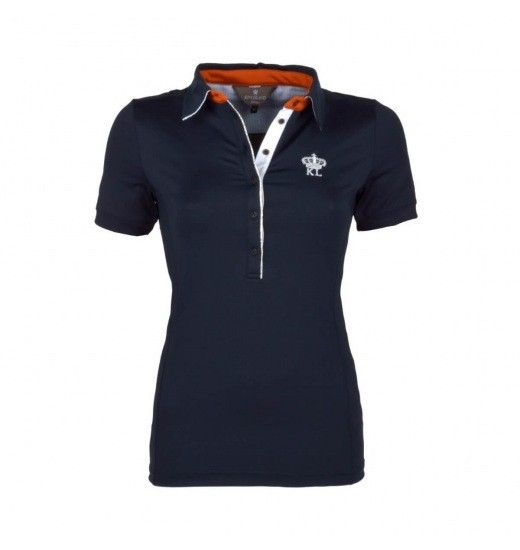 Women's training shirt with short sleeves. Neck finish with contrasting color, both from the outside and the inside. The shirt is buttoned. Button stay with contrasting decorative stitching. On the left chest emblem of Kingsland Dressage made of gold or a silver thread. Gives a classic look and fits perfectly to the body emphasizing your silhouette . Training T-shirt is made of high quality, soft fabrics.